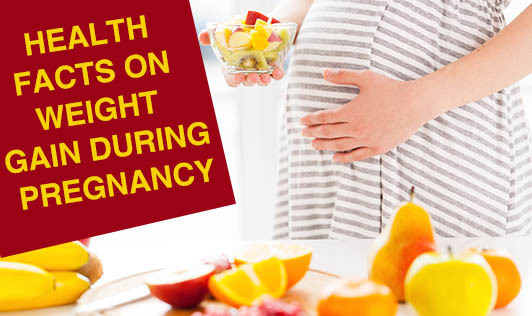 One of the key prerequisites to a healthy pregnancy is making sure you are at a healthy weight from the time you conceive to the time you deliver a baby. The weight you gain should be at a steady pace throughout your pregnancy months. If you are looking healthy, feeling healthy and your baby is growing nicely you are likely to be gaining the right amount of weight for you. On the other hand, if you do not gain weight according to the weight charts through every month of your pregnancy it doesn't mean you are unhealthy - weight charts represent ranges and averages. Check with your doctor. Every pregnant woman needs a fat reserve to ensure a continuous, steady supply of calories is available to the baby in case the mother under-eats for a day or two. This fat reserve is also useful for milk-making after baby's birth. Some women gain 8-10 pounds during the early weeks of pregnancy while others actually lose weight due to nausea or poor appetite. Most babies gain 90% of their weight after the 5th month and 50% in the last two months. During the last month it is normal for a mother to gain minimally despite baby's rapid growth: some mothers gain 1-2 pounds, some stay the same, and few even lose a bit. In some countries doctors do not practice routine weight checks on the mother at every antenatal check up because it is more effective to check baby's growth by measuring the fetal height. About one third to a quarter of the weight gained is actually your baby’s. The rest comprises of all the other elements without which your pregnancy is not possible.